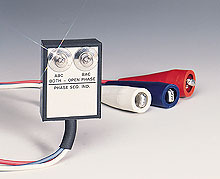 The OMEGALUX ® PHSEQ connects to any 3-phase circuit from 115 to 700 V. The test leads follow an easy-to-use red, white and blue "ABC" color code. Proper phase sequence will illuminate the "ABC" lamp. A reversed sequence will illuminate the "BAC" lamp, and an open phase condition will illuminate both lamps.